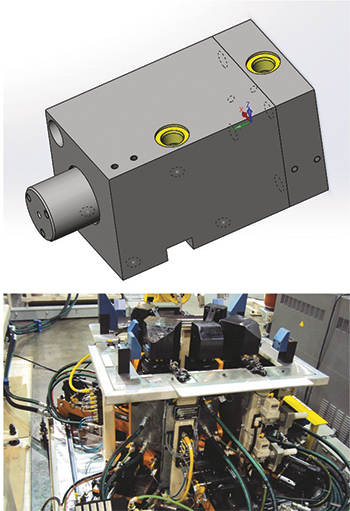 Coldwater Machine Co., Coldwater, OH, has designed its own guided rod cylinders for use in fabrication equipment supplied for punching, piercing and notching. These hydraulic cylinders feature an internally self-lubricated, guided rod within the cylinder body, which reportedly improves reliability while reducing maintenance requirements. With no external guides, the new cylinder design is compact, requiring one-third less space than alternatives. The guided pierce cylinders feature steel bodies and provide stable, nonrotating performance with the ability to reach hydraulic pressures of 3000 psi. Coldwater currently is building two sizes, based upon its most common system requirements. Coldwater uses these cylinders in equipment for appliance manufacturing, including dishwasher-panel and washer-cabinet lines, as well as for automotive frame- and body-piercing lines.